Congratulations to our graduating seniors tonight! Congratulations to our Class 2011 seniors! Our fifth school year is coming to a close as students finish their final exams and prepare for the summer. For our second class of graduating seniors, it is the end of their educational careers at East-West and the beginning of their futures. Odarri Lewis’ dragon mural in the 404 hallway. Odarri’s mural formed the design of the graduation program. Graduation will be held again at the Queens High School for Teaching and Evans J.R. Revere, an esteemed American diplomat with expertise in Asia, will serve as our keynote speaker. The ceremony will be held in honor of Odarri Lewis, a beloved East-West senior who passed away this year. On June 1st, we welcomed new parents and students for both middle and high school into our school community. 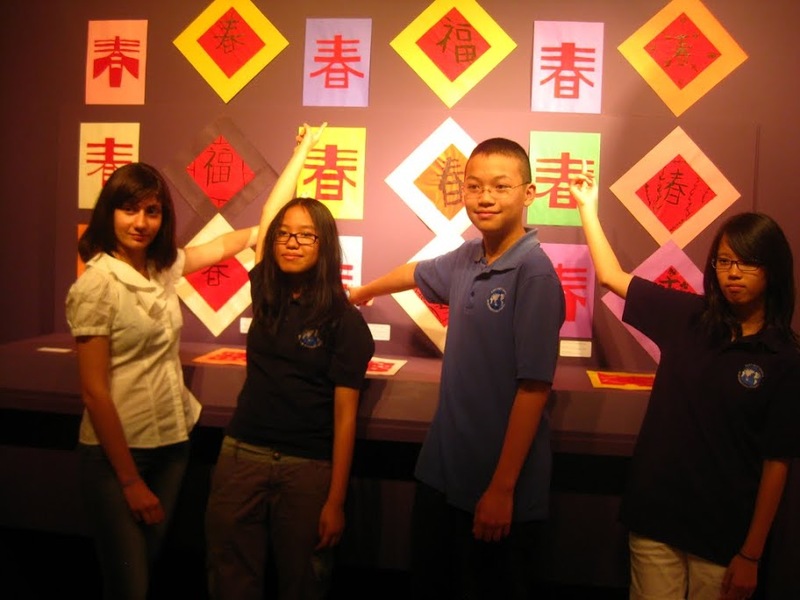 During the orientation, they met East-West administrators and teachers and were given tours by student volunteers. 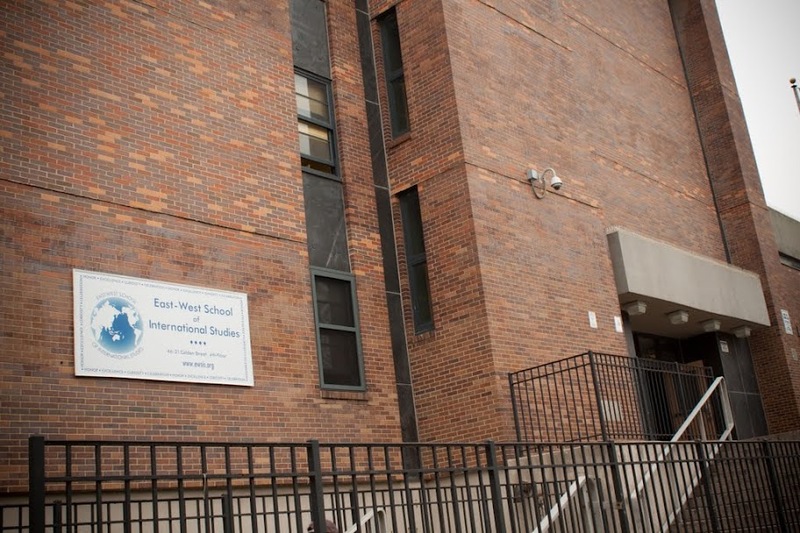 245 students placed East-West as their top choice for 90 open seats in 6th grade this year. Next year, we will see our first graduation of students who entered as 7th graders back in 2006. 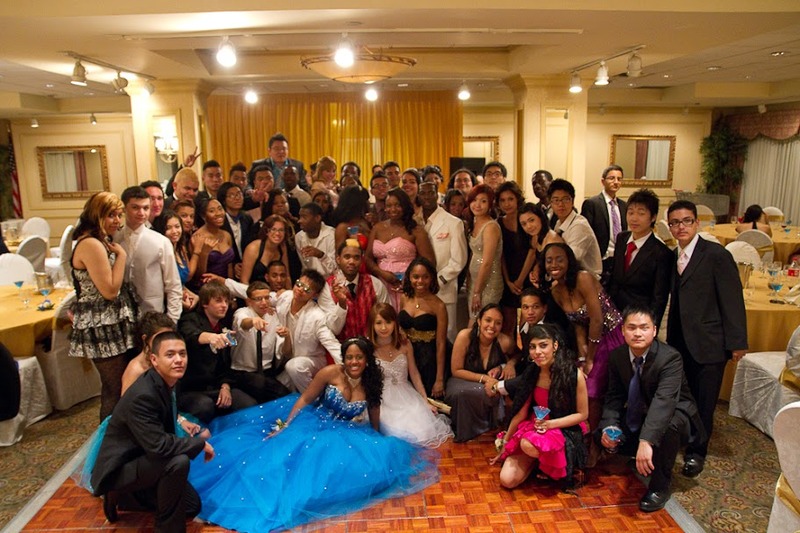 The following year, the first group of students who entered as 6th graders in 2007 will graduate. As we usher in new families and wish the best to our graduating seniors, the East-West community continues to grow beyond its walls, as does its potential to create a positive legacy in an increasingly globalized society. Let’s congratulate the students and their parents! 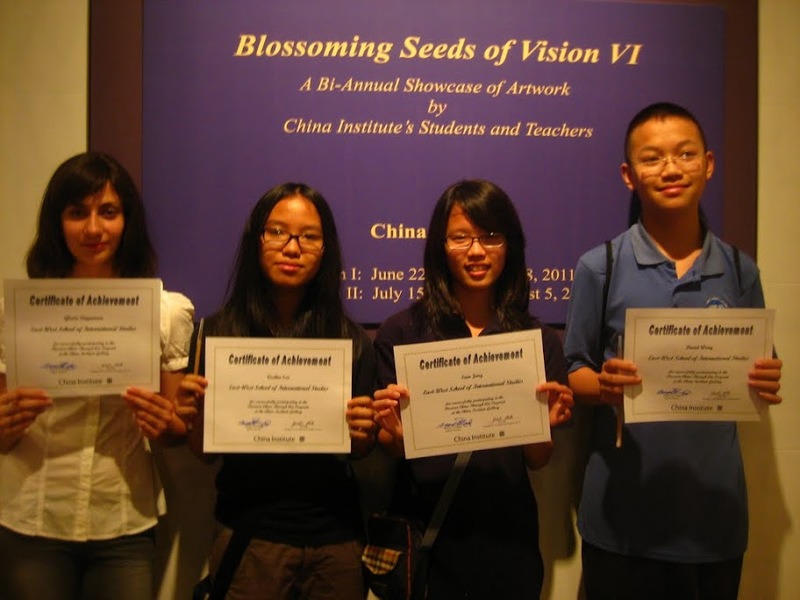 Their artwork (Chinese paper-cutting) were selected to be included in the Blossoming Seeds of Vision exhibition, a Bi-Annual showcase of artwork by China Institute’s students and teachers. We went to attend the opening reception yesterday and had a good time enjoying students’ excellent work. If you are free, please visit the gallery at 125 East 65th Street (China Institute); admission is free. Jackey Cheng won the summer scholarship to Korea and he received his award on Tuesday, June 7th. The ceremony was held at the Korean Consulate General. The award was given by the Consul General, Young-Mok Kim. He will be spending three weeks of his summer in Korea with 40 other scholarship winning students from the states. As the successors, Anthoulla Themistokleous and I interviewed the current President and Vice-President, Max Poumie and Ogo Morka to gain more insight about Student Government. We began by asking further about the purpose of this system in East-West. “Student Government gives students something to believe in and assure that their voices reach the administration,” according to Max. The students need representation to realize that their opinions matter, even in the school environment. This idea intertwines with the main goals of Student Government including the unification of the high school and the middle school. On May 25th and 26th, East-West held a production of the 25th Annual Putnam County Spelling Bee! Ms. Hartong was responsible for directing the production with the help of our students. There were hours and hours of effort and rehearsing before opening night! Two auditions were held before rehearsal officially began. Nearly 60 students auditioned for 25 roles. It was difficult to make decisions, especially since our students were so passionate about acting and singing. This play was chosen because the characters reflect the personalities of the East-West students; they’re dedicated and have a desire to succeed. Also, the comedy and the music in the play is fun! Rehearsal began in January and it was held every Thursday for about three hours. But as the show dates grew closer, rehearsal was held for nearly 6 hours a week. The last rehearsal on May 24th was the longest one, it lasted from 8 a.m. to 6 p.m. All these hours of practice clearly paid off because opening night was a success! Meet our new student leaders! Let’s get to know our new leadership team and see how they plan to get things done for East-West: Anthoulla Themistokleous and Hiba Rashid will succeed Max Poumie and Ogo Morka as Student Body President and Vice-President during their senior year. Elections wrapped up earlier in May for positions in the student government. Candidates campaigned by preparing speeches, submitting references, interviewing with student government, and participating in public debates. Student leaders are responsible for representing our student body and serving as role models for middle and high school.